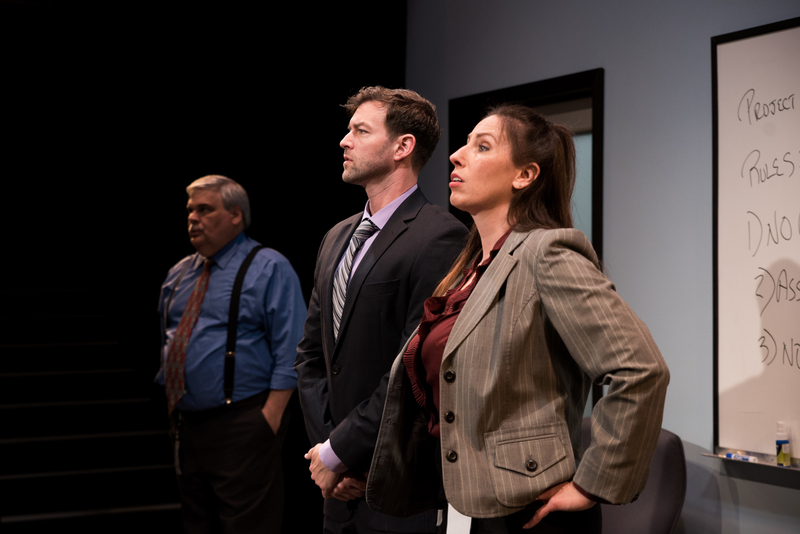 Katherine Kupiecki and Peter Christian Hansen are part of a corporate team with an ominous task in Gremlin Theatre’s production of Ideation. Photo by Alyssa Kristine. 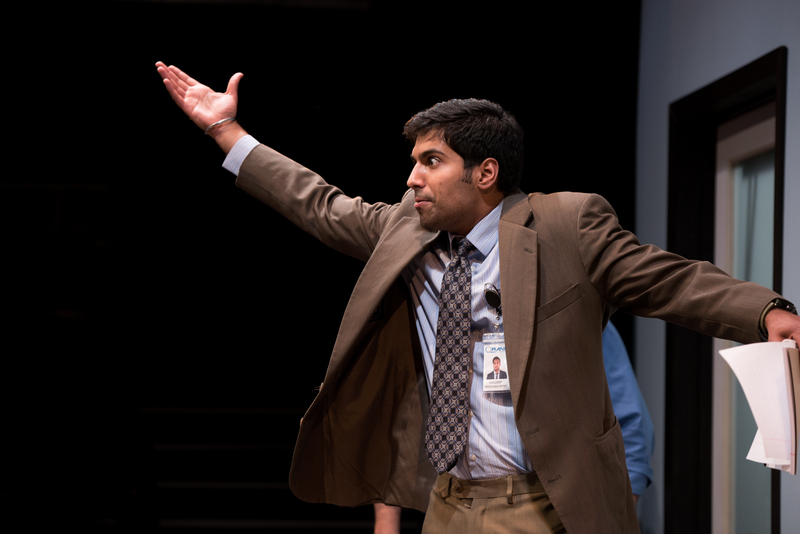 Director Brian Balcon provides a crisp, fast-paced, and often humorous production of Aaron Loeb’s play Ideation at the Gremlin Theatre. Despite the show’s many attributes, however, the underlying genocidal theme can only leave its audience with a constant queasy feeling that borders on revulsion. This feeling isn’t necessarily bad: an understanding of the true horror of what is being planned is essential to understanding the show’s gallows humor and pathos. Example: Jeffrey is engaged in paranoid ideation. In World War 2 Germany, a group of SS officers consisting of attorneys, accountants, chemists, and engineers worked out the details necessary to create the Third Reich’s final solution. Although the SS attracted ruthless, sadistic people to its ranks, the wide-spread horror of the holocaust could not have happened without the hard work of average people with the technical knowhow to implement the plan. In the world of Ideation, we see a competent team of corporate executives and engineers who take on the task of finding the most efficient way to secretly kill millions of people – and dispose of their bodies. The team is told that this is for humanitarian reasons – the given task is to save humanity from a plague where it is necessary to discretely kill those who are infected and dispose of their bodies. Sandeep (Nikhil Pandey) has enough. Photo by Alyssa Kristine. Initially, the group we follow in Ideation does not deal with the morality of what they are planning. They are more caught up with the logistics of getting people to the termination facilities and deposing of their bodies so that there is no trace. As they discuss the merits of a painful death thatalso destroys the body versus a more humane death that leaves the pesky problem of body disposal, however, the moral implications start to interfere with their planning. Group paranoia starts to run rampant when the team member who was the most vocal about the moral issues runs out into a waiting car, never to be heard of again. By far the funniest scene occurs when, without speaking a word, the remaining team members desperately search everywhere in the room for listening devices. Katherine Kupiecki plays Hannah, the corporate manager, charged with keeping the team on track. Kupiecki initially seems too nice to be a corporate manager, but effortlessly shows a ruthless side when she feels threatened. Peter Christian Hansen nicely displays his acting talents as Brock: a rising corporate star who can seem friendly but will quickly turn the tables on you. Brian P. Joyce succeeds in conveying the role of Ted, the seasoned-but-passed-over professional who provides a steady hand in working out the logistics. Nikhil Pandey’s character Sandeep is the immigrant engineer who thinks too much about the implications of the team’s task. He voices his outrage at first to his lover Hannah and then to the group. Pandey’s presence is solely missed when Sandeep mysteriously disappears. The 90-minute production flows fast, but the queasy revulsion never disappears. This show not only makes one realize that “it” can happen here, it also shows you the logistics of how “it” would happen in our corporate-driven country. Brian P. Joyce, Peter Christian Hansen, and Katherine Kupiecki in Ideation. Photo by Alyssa Kristine. Ideation closed July 29 at Gremlin Theatre in St. Paul, MN.